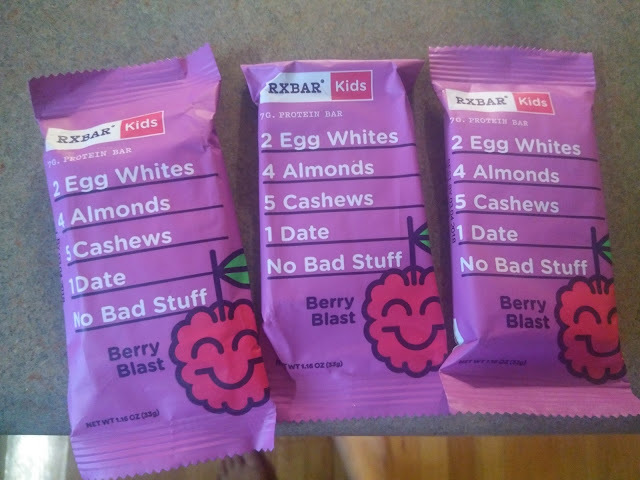 RXBAR Kids: Tasty, Real Food Snack Bar for Kids! As a busy mom of three in school now, I am ALWAYS on the look out for easy to eat snacks for the kids but that DON'T sacrifice health and nutrition! Lately, my kids have been begging for the RXBAR Kids bars (a protein bar made with real food ingredients)! The bars are made with the same core ingredients as the original bars – egg whites, dates and nuts – and contain zero added sugar with no gluten, soy, dairy or artificial ingredients. It’s a delicious, no-mess snack that’s great for an on-the-go option parents can feel good about feeding their kids. The bars come in kid-friendly portions and tasty flavors, including Chocolate Chip, Berry Blast and Apple Cinnamon – each with 7g of protein to keep kids full and focused. The kids LOVE the taste and I love that it is grab and go variety, whole food nutrition, made with pure protein from egg whites and nuts, and never more than 9 ingredients! The kids get the nutrition they need without the mess or hassle! And I love that they list the ingredients right on the front! You can purchase RXBAR Kids at Target (SRP $5.99 for 5ct) and online at RXBAR.com.